Installation of electric vehicle charging station in Ashland, MA. 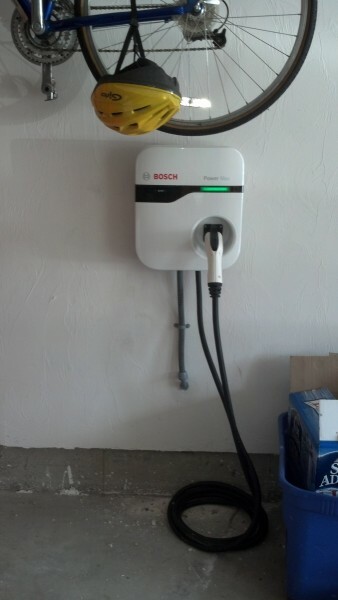 This Bosch EV charger will be used with a Nissan Leaf. EV chargers need a dedicated 240V line. They can charge the car battery from empty to full in a matter of hours. This installation only took an hour, but call Cushing Electric for a free estimate on installing an EV charger at your house. 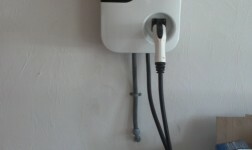 Electric vehicles are a great way to save money, and these kinds of chargers user relatively little power. We look forward to serving you with your environmentally conscious car.